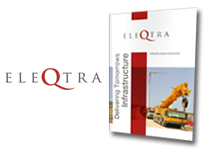 eleQtra is a multi-disciplinary project development and investment firm. Since 2005, eleQtra as Manager InfraCo Africa and now its Principal Developer, has been active in early stage Project Development, Equity Investment and Portfolio Management of greenfield infrastructure projects in Sub-Saharan Africa. Development of early stage infrastructure project through to financial close and construction. Management of equity investments in infrastructure projects across stages in the life-cycle from development through operations. Operation & management services to selected greenfield infrastructure projects.